The Canon Color imageCLASS MF8350Cdn is tailored with sophisticated features and high-quality imaging to meet your small business needs. In today's office environment, keeping your costs low is essential for a successful business. The MF8350Cdn delivers fast and accurate printing with Canon's Quick First Print Technology. Multi-page documents are ready in a short amount of time with print speeds of up to 21 pages-per-minute (ppm) in full color and black and white*. Designed for ease-of-use, the MF8350Cdn features an Auto-Duplex function with the ability to print, copy, and fax two-sided documents from single-sided originals**. 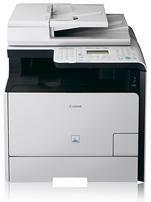 It is outfitted with a front-loading design that provides easy access to the control panel and paper sources. In-line cartridges can also be retrieved from the front of the machine for hassle-free replacement. A large LCD with graphic display provides guided user animation within the display that simplifies once complex tasks with illustrated on-screen instructions. Carry your important information with you by saving scanned documents to a USB removable media. Connect the USB removable media to the USB port located conveniently in the front of the machine to scan your letter, statement, or legal-sized documents. The Superior Color Imaging Technology featured in the MF8350Cdn captures fine details with remarkable tone-on-tone clarity, helping images stay true to the original. Canon Pure Black Technology ensures the richest blacks by utilizing only the black toner instead of traditional methods of combining toner colors. Running a successful business requires you to spend your time doing more important tasks than constantly refilling your printer with paper. The smart paper handling of the MF8350Cdn includes a 250-sheet cassette, 50-sheet multipurpose tray, and an optional 250-sheet cassette for your convenience. For added flexibility and user-convenience, the Color imageCLASS MF8350Cdn is equipped with unique features, such as: ID Card Copy, Auto Fax Forwarding, and Searchable PDF. The MF8350Cdn uses approximately 3 watts of energy during Energy Saving Mode and meets Energy Star guidelines, saving you money on energy costs. And like many imageCLASS products, the MF8350Cdn is part of the Generation Green program, Canon's initiative to reduce environmental burdens in all stages of a product's life-cycle.